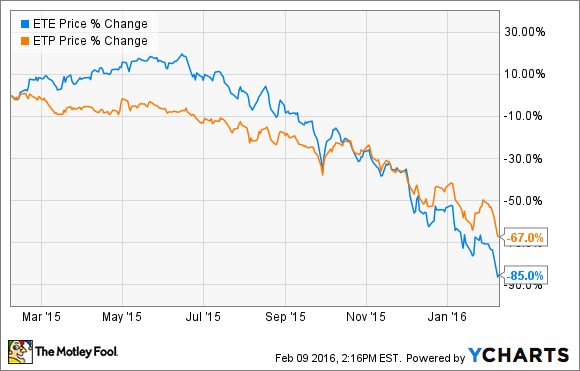 Better Buy: Energy Transfer Equity L.P. vs. Energy Transfer Partners L.P. When choosing between this parent company and its progeny, the numbers may get confusing, but the winner is clear. That being said, I do have to admit that both are now quite compelling from a value standpoint, because each derives the vast majority of its income from fee-based assets. There's a clear case to be made that the market has significantly overreacted, making their shares a compelling buy. However, if I were choosing between the two, Energy Transfer Equity is the better buy. Here's why I'd choose the parent over the offspring. Overall, Energy Transfer Equity currently receives very little income from its other MLPs with Sunoco's (NYSE:SUN) distribution being relatively minor, while those ETP Class H Units actually track 90% of the underlying economics of the general partner interest and IDRs of Sunoco Logistics Partners L.P. (NYSE:SXL), which is owned by Energy Transfer Partners. That being said, what this chart tells us is that an investment in Energy Transfer Equity is really an investment in Energy Transfer Partners, but with a twist. That twist is the fact that it receives fees for owning and managing that entity, which in a sense exists so that it can pay a growing stream of fees to its general partner. Further, the bulk of the fees it receives are incentive distribution rights, which give Energy Transfer Equity an increasing share of the incremental cash flow that Energy Transfer Partners generates. In other words, a growing share of Energy Transfer Partners' distribution growth is going to its parent, and not to its own investors. First, 100% to all Common Unitholders, Class E Unitholders, Class G Unitholders and the general partner, in accordance with their percentage interests, until each Common Unit has received $0.25 per unit for such quarter (the "minimum quarterly distribution"). Second, 100% to all Common Unitholders, Class E Unitholders, Class G Unitholders and the general partner, in accordance with their respective percentage interests, until each Common Unit has received $0.275 per unit for such quarter (the "first target distribution"). Third, (i) to the general partner in accordance with its percentage interest, (ii) 13% to the holders of the IDRs, pro rata, and (iii) to all Common Unitholders, Class E Unitholders and Class G Unitholders, pro rata, a percentage equal to 100% less the percentages applicable to the general partner and holders of the IDRs, until each Common Unit has received $0.3175 per unit for such quarter (the "second target distribution"). Fourth, (i) to the general partner in accordance with its percentage interest, (ii) 23% to the holders of the IDRs, pro rata, and (iii) to all Common Unitholders, Class E Unitholders and Class G Unitholders, pro rata, a percentage equal to 100% less the percentages applicable to the general partner and holders of the IDRs, until each Common Unit has received $0.4125 per unit for such quarter (the "third target distribution"). Fifth, thereafter, (i) to the general partner in accordance with its percentage interest, (ii) 48% to the holder of the IDRs, pro rata, and (iii) to all Common Unitholders, Class E Unitholders and Class G Unitholders, pro rata, a percentage equal to 100% less the percentages applicable to the general partner and holders of the IDRs. It's confusing to say the least, but the bottom line is this: With Energy Transfer Partners' current quarterly distribution well above the threshold of that last target, it means that the first 48% of any additional distributable cash flow goes first to Energy Transfer Equity before the balance is paid to other unitholders. Energy Transfer Equity is first in line to receive nearly half of the additional growth generated by Energy Transfer Partners. Not only that, but its income streams from its other MLPs, Sunoco and Sunoco Logistics Partners, will also grow over time as those companies, and the fees they generate, grow. When that diversification is added to its preeminent position, it makes Energy Transfer Equity the better buy between the two.